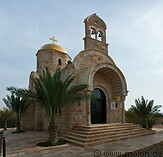 The Baptism site is an archaeological site on the river Jordan, about 40km west of Jordan, close to the border to the West Bank. This is thought to be the site of the ancient city of Bethany-beyond-the-Jordan, where John the Baptist lived and where the baptism of Jesus Christ took place. The site tourists visit is an area with reeds around Wadi Kharrar, about 1km to the north of the Dead Sea. A number of archaelogical sites have been excavated here. Tourists leave the car or bus at the visitor centre. The entry ticket is 7 JOD/person (kids don't pay) and tourists have to take a shuttle service to access the Baptism site a few km away, because this lies in a military zone. Visitors see a number of places spread over the area, some with churches of different confessions. The site is best visited in winter because in the summer the temperatures are unbearably high.